The council in Leeds is going to set up a “digital space” where everyone can collaborate to help solve the city’s problems. That’s because the brief quote above doesn’t come from a press release or council document, but from a comment written this morning by Mr Roberts on a Guardian website. And I can’t find anything about it anywhere else. There’s a further brief announcement too in his comment – that the council is going to establish an Open Data Institute. 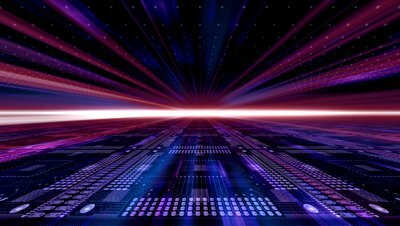 “We’ll put Leeds on the map as a centre for data analytics securing new opportunities and establish an Open Data Institute that will encourage the open data culture boosting the city economically, environmentally and socially,” he says. 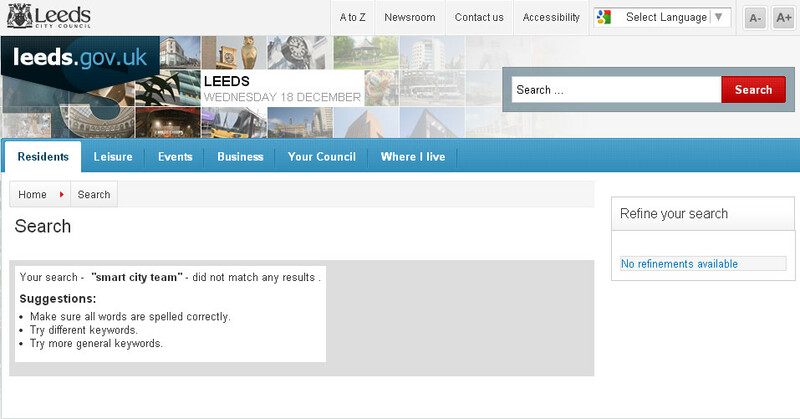 You may not have noticed, but simply everyone is talking “open data” in Leeds these days. If, like me, you’re not sure what open data is but want to get with the programme, there’s some info here, but it’s sketchy. 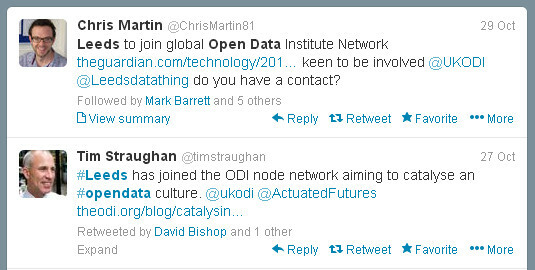 Anyway, it’s not clear whether this new council institute is going to be different from the other Open Data Institute, the one founded by Tim Berners Lee, that “Leeds” apparently joined as a “node” in Autumn. Not clear either where the future council-backed institute fits in with the latest private sector (or non-public sector, at least) plans to launch a new open data platform for Leeds. 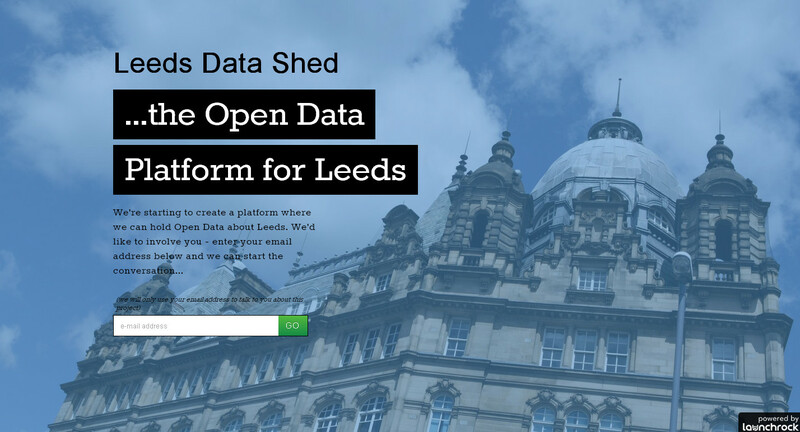 That platform – known as the Leeds Data Shed – is going to be a community resource that holds open data about Leeds. My guess – from the tweet below from the Chief Economic Development Officer at the council – is that they’re all one and the same: that we’re talking a Leeds public-private-opendata-partnership-hydra, the reach of whose tentacles is being negotiated in civic meeting rooms as we speak. All will no doubt be revealed. This entry was posted in Uncategorized and tagged ledsds city council, leeds, leeds datashed, open data institute, smart city team. Bookmark the permalink. Sounds great, would love to be involved! I was being generous when i interpreted his “all sectors” re the problem-solving “space” as being thee and me. Pretty sure he means the usual partnership suspects. Don’t know what sector the Data Shed belongs too. Those of us who don’t align don’t count. A new generation of mayors is taking on the challenge of reinventing cities for the 21st century. IBM’s 2013 report, How to Reinvent a City: Mayors’ lessons from the Smarter Cities Challenge, shares the insights mayors learned from their participation in this IBM Citizenship initiative. Most these views were harvested at the Smarter Cities Challenge Summit, a gathering of mayors and other city leaders held November 14-15, 2012, near New York City. Participants hailed from more than 30 cities, ranging from Philadelphia and Burlington in the United States, to Nice and Katowice in Europe, and to Tshwane in Africa, Porto Alegre in Latin America and Cheongju in Asia. It looks like a very successful marketing campaign by IBM to me! Gone all a do-dah after a quick peek at that, especially when they say that Birmingham is using guidance from the Smart Cities Challege Team to make evidence-based decisions on dumping ineffective programs. Crikey! The wibble factor of the data thingie yet to be determined.